Learn how we can have a more robust grid, lower balancing costs and lower peak demand. And more space for intermittent renewables! Electricity grids already have to cope with large swings in demand, minute-by-minute, cycle-by-cycle, and at least in part unpredictable, as well as the planned and sudden/unplanned disconnection/failure of generators. With an increasing proportion of intermittent renewable generation such as wind in the mix (overtaking hydro for the first time in 2007 in the UK for example), the task gets a little harder. Grid operators such as the National Grid in the UK deal with this 'balancing' in a number of ways, including generators on hot (eg 'frequency-response') or warm or cold standby that can respond to power shortfalls with varying degrees of speed and efficiency on the 'supply' side of the equation. On the 'demand' side, ie how much power is required moment-by-moment, large users have time-of-day (ToD) contracts, often in half-hourly (HH) slots, where they are charged more when demand (and thus wholesale price) is higher, which encourages them to move their loads to other times of day. UK domestic users with electric water and space heating can sign up for the "Economy 7" tariff of 7 cheap night-time hours (often 1am to 8am) which is a relatively crude from of ToD pricing, mainly designed to ensure that the output of nuclear power stations and other baseload generation that cannot be turned down at night when demand is relatively low is actually used productively rather than being run to earth and wasted. This is not intended to respond dynamically to short-term grid stress but it does help shift load away from peak times. Grid operators also have contracts with large commercial/industrial power users to allow instant remote/automatic disconnection of the users' load by the operator at times of grid stress/emergency, such as when a generator 'trips' and goes off-line. The user may get a regular payment proportional to the size in kW of the load and how long per day it can be disconnected for. Large cold-stores don't mind power interruptions for a while once cool enough so make good interruptible (shed-able) loads, for example. All of these are large centralised chunks of control and power. As I've noted elsewhere, distributed microgeneration with storage might be able to help with balancing, though it could be an administrative nightmare for the grid operator to manage and monitor thousands-to-millions of such 'embedded' contributions without some kind of commercial aggregator, even if the potential super-fast response from battery would be very good. Another distributed solution in terms of non-industrial users is to have [archive] domestic appliances that are big consumers of electricity, especially those that heat or cool, but with no desperate real-time deadlines to meet, to automatically defer some of their load when the grid is under stress. When the mains frequency (or in more extreme cases the voltage) drops below the specified nominal value (50Hz for the UK for example) it is a clear indication that the grid is under strain. This can be used in 'dumb' but energy-hungry domestic appliances such as fridge/freezers, washing machines and dishwashers, immersion water heaters, heat pumps and air-con, maybe even electric cookers/stoves, hairdriers, etc, etc, to defer or reduce their activity (drop their instantaneous load in Watts), eg by adjusting thermostats slightly and reducing the rate of resistive heating, spreading their energy consumption over a longer time and away from the crisis. It potentially only requires a fairly simple/cheap bit of extra electronics. The response of some grid-friendly appliances can be very fast, reducing demand for (resistive) water heating for example within a tiny fraction of a second if need be, mains cycle by mains cycle. Some other appliances, eg those that have components that should not be 'short cycled' such as heat-pumps and fridge/freezer compressors, will have a more leisurely response of the order of seconds or minutes. Another emerging class of heavy domestic power consumers is the electric car, and operators are already working with car manufacturers on "vehicle-to-grid" (V2G) solutions where the car is grid-sensitive, backing off charging when the grid is loaded unless a journey is imminent, and possibly even contributing some of its energy back to a stressed grid, on the lines of the microgen support that I mentioned above. V2G response to grid stress can probably be very fast if necessary. There has been some interesting recent discussion in the light of US presidential candidate Obama's energy policy. Smarter Internet-connected (or radio-equipped) devices such as computers can potentially be given more sophisticated signals to trim power consumption using their already-present power-saving mechanisms to achieve the same end; to allow automatic distributed dynamic demand control of possibly millions of smaller devices, and without significantly inconveniencing the end users, and probably in fact improving reliability and reducing electricity costs. Computers can often trim some elements of consumption very quickly, eg CPU speed and load, and others will be slower such as spinning discs down. Some operators around the world already use mechanisms like these, eg: [archive] "ripple control" of water heaters in New Zealand and South Africa, so it certainly can be done and need not be prohibitively expensive. Indeed, software installed in Internet-connected computers can be essentially free for example. Combined with dynamic time-of-day pricing these could be powerful tools to improve grid service and admit more intermittent/renewable grid energy, allowing appliances to consume when it's available and defer when not. Thus far, [potential providers that we have been talking to] are proving to be technically capable of providing a service and the providers feel they are economic at our present costs. In order to facilitate a route to market for dynamic demand we are presently looking at a number of our services and proposing a number of improvements. Dynamic Demand replaces on-demand instant Megawatts of load-following generation in the conventional 'frequency-response' grid balancing system, often using relatively carbon-intensive part-loaded open-cycle gas turbines (OCGT), with on-demand instant 'Negawatts' of automatically-conserved power. But what actual value might accrue from these benefits, and does it exceed the capital and other costs of the enhanced equipment, ie is it financially worth supporting this distributed grid balancing? I assume for now that distributed 'dynamic control' is not necessary to keep the lights on, and that centralised solutions can continue to take the full strain if need be (although 'dumb' electric vehicles might test that assumption rather harshly). In other words, is it cheaper or better (or at least comparably good) to use this distributed mechanism as part of the UK/EU mix rather than just doing everything centrally with 'big iron' as has been the case to now in the UK? The National Grid publishes its balancing costs, so other than any infrastructure peak capacity savings, we know what the maximum monetary value today might be if every suitable domestic appliance magically became grid-sensitive, given an estimate of all the load/power they would sum to and the correlation of their load times with the times that balancing is needed. These balancing costs in the UK grid are close to £500m (USD1bn) in 2008, representing possibly as much as £5 per year or 1% on the average domestic electricity bill. At a very shallow analysis the extra/capital cost of adding grid-sensitivity to domestic appliances should not add (much) more than this (£5) per year to be financially viable, allowing for the lifetime of the appliances concerned. That 'budget' doesn't seem too hard to meet implying a factory-gate price hike of maybe £1 per appliance (assuming 1:5 factory:retail price ratio, cheap ~200ppm crystal timebase, etc) if the average household replaces no more than one major appliance per year on average. Considering that the applicable appliances tend to cost in the range £100 to £600+ then an extra £5 on the purchase price that in effect might contribute to paying for itself within a year is not bad. I assume that in volume the extra electronics for basic dynamic response will cost pennies at the factory gate. The total load of grid-sensitive appliances may not be high enough to displace all the spinning/frequency/other reserve needed for balancing, ie in terms of GW, of the order of 15-25% of UK peak or maybe very roughly 15GW. Not all appliances may have deferrable load all the time, ie I must charge the car and wash my clothes now to be able to make my meeting or catch my plane or whatever. Not all of the deferrable load may be available when balancing is needed, eg we won't all be washing our clothes when a nuclear generator trips. Not all of the deferrable load can be deferred instantly, eg because of short-cycling and similar constraints. Most of the mechanisms discussed above reduce demand when the grid is overloaded, but sometimes the reverse is needed, to absorb excess power when load is lower than expected in all or part of the network. The simple mechanism for 'dumb'-ish appliances based on mains frequency cannot respond differently in different parts of the UK because the mains frequency is the same throughout (synchronous), whereas transmission limitations might mean that we have excess in some parts and shortages in others. Whilst well-understood engineering solutions from areas such as networking (eg randomised exponential backoff and slow-start) can be used to avoid grid instability even with millions of autonomous participatants, only a fraction of the response could be explicitly directed/'called'/'dispatched' by the grid operator eg in anticipation (such as home PC power consumption via the Internet), and the rest would follow its preprogrammed reactive randomised course which might make turning the supertanker that is the grid significantly more cumbersome and delicate. We also have projections from the National Grid as to how their balancing costs will change over time, in particular to deal with more intermittent generation. Those balancing costs can reasonably be expected to rise, thus potentially increasing the value of quick-acting 'dynamic demand' by reducing the amount of inefficient 'peaking plant' and 'frequency response' plant that would have to be kept running. If dynamic demand technology was to be scaled up to the entire EU, eg though support from appliance energy-efficiency labelling and VAT mechanisms, then it would be important to see if approximately the same costs/benefits apply and if overall the scheme would be valuable. The UK experience does not directly translate to other corners of the EU; for example the Scandinavian cross-border integration of nuclear, wind and hydro potentially goes a long way to solving the balancing issue for the area as a whole even at high levels of intermittent generation. Denmark has >20% wind and does sometimes export excess (reducing hydro use) and sometimes imports heavily when winds are low; it could not easily stand on its own. Distributed dynamic demand control of domestic appliances can also potentially help with the 'dull windless day' scenario that becomes more important as the fraction of wind/solar/etc generation rises by automagically letting non-critical things run slower or be deferred until more energy is available. That would mean that we absolutely would not need 100% fossil-fuel dispatchable generation to 'back up' our renewable sources even when all normal 'intermittent' generation was (freakishly) absent, since this type of mechanism could help hold down demand somewhat for hours or even days at a time if necessary, along with other extant tools at the System Operator's disposal today. The flip-side is that the cost of the electricity for the wash could be slashed if you set the washing machine to wait a while until the grid is showing signs of excess available power by pressing the 'Economy' button. In either case the total energy used to perform the wash may be similar, but in the 1 hour case the water is heated at half the rate/power (and maybe to a slightly lower temperature to economise still further), halving the peak load on the grid from this appliance. The extra time spent agitating the clothes while the water heats ensures that the slow economy wash is as good as a normal one. Likewise, all non-urgent washes would take 1 hour instead of 45 minutes until the wind picks up, so the lights stay on without fossil-fuel burn. This implies that you'd not only be charged a variable amount per kWh by ToD, but also a premium for using energy (too) quickly when the grid is stressed. So using electricity slowly and using less of it at such times is encouraged. Some utilities already have tariffs like this in place. Domestic microgeneration can also provide 'reverse dynamic demand' support by dropping off the grid (stopping generation) relatively quickly as the mains frequency (and voltage) increases, but hanging on grimly pumping in energy for much larger relative falls from nominal central values, ie by being deliberately asymmetric in its response to grid loading/stress. Here I try to summarise potentially dynamically-controllable domestic loads on short (very temporary, of the order of seconds) to long/permanent (days) timescales for the UK. The UK grid already has demand/supply matching on these scales, though below ~1.5 hours is more typically considered 'balancing' and dealing with unplanned plant (and transmission) outages/failures, or even 'demand pickups' after popular TV and sporting events. The medium term of 'hours' is often concerned with 'load shifting' to lower peak demand and to reduce infrastructure and 'peaking plant' costs. The longer end of the scale is dealing with extended supply imbalances, such as a long series of dark cold calm days reducing renewable energy supply. I attempt to tabulate the different appliances' possible responses by short/medium/long term timescales in the UK. Short-term deferrable demand of a few seconds to a few minutes can help with a crisis/emergency such as the unplanned 'tripping' off-line of a major generator such as the 1GW+ of Sizewell in May 2008. Clearly almost every domestic heating element could stop drawing power for up to a few seconds without disaster (or probably anyone noticing), almost every fridge could avoid starting its compressor, every washing machine and dishwasher could stop spinning/pumping/etc, to give the grid a few seconds to breathe and other standby generation to start. For example, in the UK "a number of Open Cycle Gas Turbines are set to operate by low frequency relays (set at 49.5Hz and 49.6Hz) and should [reach] full MW output  in around 5 minutes", so filling in that 5 minutes with dynamic demand control is potentially useful. Medium-term deferrable load helps cut regular daily peaks (such as from everyone cooking when they get home after work), for example by delaying electrically heating water or running a heat-pump for central heating. Programmes/tariffs such as Economy 7 (less than 30% of all domestic supply) already provide incentives to shift load, including other loads such as dishwashers that can be put on timers. Increasingly dynamic ToD/HH/emergency pricing and dynamic demand might work well together to easily shift more load and trim peaks. Long-term deferrable consumption would allow less standby generation to back-up intermittent renewables such as wind and sun and wave. Note that in National Grid's recent SYS (Seven-Year Statement) it assumes that if the UK increased wind name-plate capacity on the grid to ~25GW (somewhere between one third and one half of unrestricted winter peak, ~10x the 2008 installed capacity, a reasonable target over the next ten years or so, and by which time most domestic appliances would have been replaced and could have dynamic demand controls in the replacements) then the UK could only retire 5GW of conventional thermal 'backup' plant. (That is, retiring only 2GW more than if just 8GW of wind was on the grid.) Normal grid margin for non-wind plant is ~20%+, so the intermittency gap here is ~60%, and ideally, we'd like dynamic demand to allow the retiring of that extra 15GW ~10 years from now to eliminate most/all of the extra system and balancing costs related to wind. This table includes estimates for typical 2008 electricity demand levels and what might be deferrable on the given timescale, with examples of specific load components that are and are not deferrable. The estimates of what fraction of mean load is deferrable in each timescale are largely educated guesses by me, with some justification given. The implication of the numbers above is that dynamic demand might be able to perform almost all the 'extra' essential grid support on short timescales for 25GW of wind on the UK grid compared to 'normal' thermal plant instead of retaining less-efficient peaker and frequency-response backup, ie ~15GW+. For dynamically deferring load a few hours to cope with medium-term dips in intermittent sources such as wind, and allowing highly-efficient thermal plant such as CCGT to step in, it seems as though grid-friendly appliances might obviate maybe 33% of the 'extra' grid support/backup otherwise needed, ie ~5GW+. For long-term dips/outages of the order of days (such a long cold still snap) the dynamic demand mechanism may only be able to help suppress demand a little, ie maybe ~2GW+, but 'long-term' is not the primary focus of this technology, and for long time scales explicit information campaigns (etc) may be needed, plus the firing up of more baseload-like plant if available, and other System Operator tools such as voltage reduction and rationing. National Grid as the grid System Operator has various targets and legal obligations as to how much it is allowed to let parameters such as frequency wander from their nominal/central values. To protect the majority of the grid, automated 'low frequency' (ie frequency-sensing) relays start shedding load to protect the grid at -1.2Hz (48.8Hz) with 5% of total grid load intended to be disconnected in this first tranche. There will naturally be some 'wiggle' in the frequency as demand and supply will never balance exactly to the Watt at every instant, but if the wobble gets too big then something is going wrong and needs fixing. An analysis of figures supplied by National Grid for August 2008 (.xls) (a frequency sample every minute for the entire month) indicates only one sample out of nearly 45,000 potentially below the operational -0.2Hz target, but ~3% at or below -0.1Hz (ie frequency ≤49.9Hz) and ~17% at or below -0.05Hz (ie frequency ≤49.95Hz). Thus if dynamic demand control in domestic appliances is to be of help with (and reduce the cost of) 'balancing' of today's UK grid, it would have to start to intervene before the -0.2Hz operational limit. Somewhere between one half and one quarter of that limit looks plausible, especially if the response can be graded and smoothed, where it will help a small proportion of the time but with the current/normal grid mechanisms doing the fine tuning. An analysis of figures supplied by National Grid for 2008/05/27 (.xls) where a series of generator problems resulted in 500,000 people being 'load shed', ie getting a 40-minute power cut, suggests that over ten minutes were spent outside normal operational limits, and about nine of those outside statutory limits, with ~5% at or below -0.1Hz (ie frequency ≤49.9Hz) and ~21% at or below -0.05Hz (ie frequency ≤49.95Hz). For a large chunk of the day various DNOs (regional distributors) were helping curb demand by reducing voltage too. This initial analysis suggests that, for example, all non-critical heating loads (for example) could be dropped and stay off when the mains falls below the lower statutory frequency limit (49.5Hz) since the grid is clearly in significant trouble at this point and this condition does not last long even on the bad day examined above, with all other significant adjustable activity briefly suspended or reduced (continuously/stochastically in proportion to the frequency deviation if possible) as the frequency drops below 49.9Hz--49.95Hz, with load restoration in particular randomly staggered by time and/or frequency to avoid introducing instability/oscillation to the grid. Dishwashers and washing machines (water heating). Electric ovens, microwave ovens, cooking/hob rings. Electric kettles especially any rated above (say) 1kW. Electric immersion/storage heaters and heat-pumps/air-con. These will usually have no way of directly detecting grid load/state themselves other than by monitoring frequency, and frequency-based response is thus assumed for them. This mechanism should work fine in conjunction with other peak-shifting schemes that may only supply power off-peak but which can cause a surge when large numbers of such off-peak devices are powered up simultaneously at the start of the off-peak period. The first mechanism primarily deals with short sudden drops in supply vs demand, whereas the second is also a longer-term load-trimming mechanism. For the initial few minutes of a severe energy shortage (ie a large drop in mains frequency, by more than ~0.2Hz for the UK) heating/cooling would turn off entirely. (This off period might be limited to a few seconds for interactive/fast applications such as kettles, electric hob rings and microwave ovens.) Mechanical agitation in washing machines, dishwashers, etc, and circulation pumps for central heating, etc, would continue once started but any new activity might be deferred, as would be the case for heat-pump and fridge/freezer compressors. As a bonus of having this mechanism in place, having some appliances 'soft start' by deferring (full) power consumption when mains is first connected would also help the grid after blackouts and more routinely (for example) when off-peak circuits activate. If the grid does not fully recover within this initial short interval above (but is back within normal operational limits), some appliances such as dishwasher and washing machine could almost certainly turn back on heating elements but at (say) the minimum of 1kW or 50% of maximum rating (and in conjunction with reduced target water temperatures described below) without massively extending the wash cycle time; such appliances need never revert to full power when the grid is strained, except possibly upon a manual request via an 'urgent' momentary button. Modulatable heating/cooling such as immersion heaters could run at significantly (say 50% of maximum) reduced power for a longer period (a significant multiple of the initial completely-off period) without compromising the ability to store/shift enough heat through the day. Immediately in the case of mild grid strain, else after any heavier modulation above has run its course, and indefinitely to mildly reduce continuing demand, heating/cooling power could be down-modulated slightly, say by 25% to 10%. (Other variable-speed/load devices such as some circulation pumps and inverter-driven heat-pumps and a/c could run slightly below maximum.) Not enough to be a severe annoyance, but enough to reduce peak household demand and some waste. (Though longer running periods to achieve 'fixed' goals/targets are likely to result in more overlap from separate loads, and therefore less aggregate grid peak load reduction than otherwise apparent.) DNOs may also at this stage, under instruction from the grid operator, be reducing mains voltage (inducing a 'brown-out') to reduce demand (~10%) mainly from resistive loads (eg heating elements), though a large population of grid-friendly appliances should reduce the need for this (already rare) step. Note that under any significant grid-strain, thermostats should be adjusted where possible (ie with an electronic rather than mechanical thermostat) for the entire duration of that strain/shortage to defer consumption in the short term and reduce energy consumption though insulative losses (etc) long term, which implies lowering target temperatures for heating and raising target temperatures for cooling. The change in temperature should not be enough to be damaging or annoying, and in the case of washing appliances could often be compensated for by lengthening the wash time while continuing mechanical agitation. (Biochemical activity generally follows a "Q10=2" rule, ie that a 10K (ie 10°C) drop in temperature halves the speed, so dropping the wash temperature 10K might require up to twice the time to achieve the same result. The power of the heating element can be reduced to achieve the new lower target over a similar fraction of the extended wash/agitation time, thus reducing instantaneous power and total energy consumed. The wash time can be suitably extended to allow for whatever the unheated inlet temperature is in extremis, ie foregoing any water heating at all if need be, which at say 10°C lower in winter might at most double wash time again for a given fixed, very much reduced, energy consumption.) 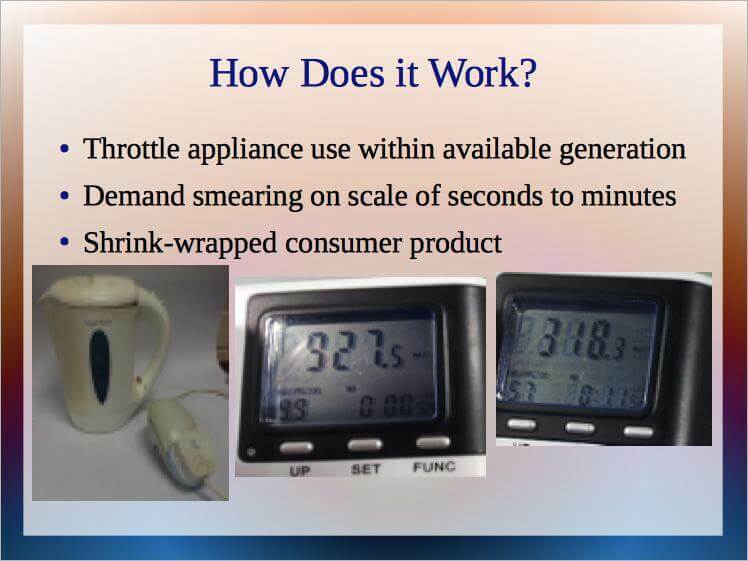 There may be other goals/targets for appliances other than temperature which can also be trimmed at times of grid load without significant problem; eg rinse duration, non-final-spin speed, oven/fridge light level, etc, to assist with both short- and long- term demand reduction. All modulation of demand should be somewhat randomised to avoid itself making the grid unstable with synchronised mass switch on/off of the 'dynamic demand' devices. The delay to reduce or drop loads/demand after a frequency drop should be a small random number of cycles (not too long a delay since a fast response is generally helpful) with the ability to cancel or further delay the load drop if frequency is detected to rise/recover during the delay. Switching back to full load after the grid recovers should be randomly spread over a much longer time for stability. The duration of each segment (fully off and reduced/modulated load) should also have a random spread around the mean value. When power/load is being down-modulated but not entirely turned off, ideally this accomplished by using a constant lower-rated element (etc), but alternatively a PWM (Pulse-Width Modulated) type scheme may be needed, probably synchronised with main cycle zero crossings, but with a scheme to avoid appliances becoming synchronised to one another. The PWM control might, for example, be run from a simple RC oscillator whose frequency is allowed to drift with ambient temperature. In any case the scheme should not be tightly tied to time since power on to avoid accidentally synchronising behaviour after a blackout for example. It's clear that the kgCO2/kWh pollution of grid electricity is not constant, and includes large daily and seasonal variations based on demand, resource availability and supply mix, etc, etc. For example, if load were totally constant and covered by nuclear and hydro 'base load' generation, then we'd be practically zero-carbon. Given that daily/seasonal peaks over base load require fossil fuel generation to fill at least some of the gap at the moment, the non-constant demand implies more CO2 in the day and in winter. Dynamic demand along with pricing mechanisms could also be used to lower the CO2 emissions of our electricity supply by trimming the dirty peaks. Thus the System Operator might aim to always operate the grid frequency a little below the nominal 50Hz at (CO2/kWH) peaks even when supply and demand are in balance, to reflect the carbon-cost and defer a small proportion of consumption. In conjunction with smart metering, for example, it might be possible to charge a higher rate when the grid is under strain, and a penal rate if instantaneous use is (say) over 3kW or 1kW per household (which corresponds to running one or more major appliance(s)); conversely, a discounted rate might be given for instantaneous use under say 40W (1kWh/day) or 100W, with the discount enhanced further with the grid overloaded, to encourage people to turn off standby, use efficient lighting and turn it off when not needed, and to buy goods that implement DD and defer load automatically as needed. At 100W per UK household which might reasonably cover lighting and TV (say), total UK domestic electricity consumption would be under 3GW. It has become apparent to me over the last year or so that the whole spectrum from the cycle-by-cycle response up to time-shifting by hours up to days (eg to low load at weekends) has its part to play in reducing emissions and allowing more intermittent generation on the grid. It has also become clear to me that for our household and maybe many others in the UK, the easiest time-shifting to cover hour-long energy droughts/surfeits (eg to deal with peak-shaving and renewable intermittency) is probably the dishwasher then the washing machine. For example we try to run warm or hot washing-machine loads at periods of low demand and low carbon-intensity which for convenience means timing the cycle to finish as we get up so that the clothes won't get horribly creased, and the energy-intensive early part of the cycle is way down the load curve. Equally, we always try to prime the dishwasher to run in the wee hours (~2am) rather than the rather-tempting-but-peak-load early evening after dinner/supper. Each of these could easily in future also have dynamic demand modulation (such as of the heating) to respond to shorter-term transients. On very short (cycle-by-cycle 'dynamic demand') timescales are domestic cooking and heating (eg central-heating circulation pumps), with 'storage'-based examples that can 'coast' for a while such as fridges and immersion heaters. Storage-based items can also work as long-range day-long load shifters. A clear commercial opportunity at the short-term scale remains air-con, with longer term ice-based 'cool' storage for shifting grid demand to night. Other refrigeration and heating is good too, but there may be bigger less-obvious opportunities such as ramping up an energy-intense production line and running 24x7 to soak up abundant cheap wind power from an incoming front and giving staff the day off in calm high-cost times. IT as a rapidly-growing energy guzzler should also play its part: if I can cut two orders of magnitude (100x) out of one set of my Web services in two years, and make my servers sensitive to local grid carbon intensity, then there is surely scope for basic energy saving and more dynamic management of consumption from others too. It recently occurred to me that some devices/appliances themselves meant to improve energy effiency, such as MHRV (Mechanical Heat Recovery Ventilation) running continuously, might themselves be good candidates for grid support as a few minutes off would do no harm. (Maybe not in 'boost' or override modes though except in very dire circumstances.) Should regs (eg building regs or EU eco efficiency rules) be amended to insist on this second string of energy security for new devices if cheap enough? MHRV may be of the order of a few Watts to tens of Watts per new/retrofitted household, so maybe ~250MW for the UK at most as building stock is upgraded, but there may well be other applicable devices too, and getting this virtual power plant built into the infrastructure seems all good to me. Happily, I seem to have encouraged two senior bods in DEFRA and DECC to discuss this, with a view to possibly starting the glacial (5-year) standards ball rolling! 2018/09/12: Flexitricity lands £500k funding to bring smaller firms into DSR, seeks trial sites. 2018/08/29: Myths of baseload and intermittent energy: It's not what you think: "At a recent seminar in Melbourne, at the Climate and Energy College, one of the country's leading electrical engineers, Kate Summers, showed these series of graphs that illustrated that — at moments when stability can be won or lost — it has been wind and solar that have held firm, and acted as what one might consider to be 'baseload'. And it has been coal and gas that has proved 'intermittent' at the very minutes that stability is needed." 2018/04/19: Gravity-based energy storage could prove cheaper than batteries: "Analysis from Imperial College London suspending weights in old mine shafts for frequency response could be cheaper than other options ... [at] $141 per kW, compared to $154 for a lithium-ion battery, $187 for lead acid batteries and $312 for flywheel. The numbers assume the storage performs 700 cycles per year of 15 minutes each, at a power output of 4MW... "
2018/03/26: Why Supermarkets Should Switch to Renewable Energy: "... Once all food safety requirements have been met, supermarkets can, on average days, make their unused capacity available as thermal storage. 2018/01/04: Less peaky demand against arbitrary clock hours would help both with the need for, and then delivery of, dynamic demand response: Against the synchronous society. 2017/12/04: Can storage reduce electricity consumption? A general equation for the grid-wide efficiency impacts of using cooling thermal energy storage for load shifting: "... it is possible to identify operating conditions such that CTES increases system efficiency rather than decreasing it as is typical for conventional storage approaches. A case study of the Dallas-Fort Worth metro area in Texas, USA shows that using CTES to shift daytime cooling load to nighttime cooling storage can reduce annual, system-wide, primary fuel consumption by 17.6 MWh for each MWh of installed CTES capacity. The study concludes that, under the right circumstances, cooling thermal energy storage can reduce grid-wide energy consumption ..." and I suspect also supports shifting some (eg) domestic loads such as dishwasher to night time when there is insufficient renewable cover as resulting thermal fill-in likely more efficient. 2016/04/04: How can we make the electricity system more flexible? "Industrial and commercial demand accounts for more than half of electricity demand at peak times." 2016/03/04: Smart energy could save £8bn a year, say advisers. 2016/01/16: Optimising battery storage to extract maximum value. 2015/08: Managing Flexibility Whilst Decarbonising the GB Electricity System. 2015/08/13: Why your kettle could take longer to boil when the wind isn't blowing: Voltage of household electricity supplies could be routinely reduced to help manage intermittent renewable energy. 2014/11/03: £250 energy saving from new 'black box' from Tempus. 2014/10/24: Open Automated Demand Response (OpenADR) is an open and standardized way for electricity providers and system operators to communicate DR signals with each other and with their customers using a common language over any existing IP-based communications network, such as the Internet. 2014/08/08: The head of the UK Demand Response Association says there's a better way to organise our confusing energy market. 2014/06/10: National Grid offers companies cash to cut power use: "National Grid is looking to save up to 330 megawatts (MW) of power demand capacity this winter" and "Companies that agree to cut their use will receive a payment, National Grid said." 2013/12/09: ‘Blackout’ Britain? Waking up to demand-side response, including "post-fault DSR", ie delayed reconnection after a fault. 2013/07/22: The Dynamic Demand Challenge: £50,000 for a new idea in this area; see the ideas. 2013/07/18: Data centers and distributed renewables: two peas in a POD: dynamically move computational load to where the wind is blowing, etc, to avoid transmission losses and need for 'backup' generation. 2013/03/04: Why windfarms get paid to switch off. 2013/01/12: Flex Alert: "an urgent call to Californians to immediately conserve electricity and to shift demand to off-peak hours (after 6 pm)." @flexalert. 2012/08/21: Automated demand response key to intermittent renewables suggests that automated DR is ~10x cheaper than storage currently. 2012/02/14: http://www.renewableenergymagazine.com/energias/renovables/index/pag/miscellaneous/colleft/colright/miscellaneous/tip/articulo/pagid/19196/botid/128/ Including "a 2.5MW system, two 100kW systems and three 50kW systems. Each will be designed to maintain these power capabilities for up to two hours." 2012/02/01: Energy Management System Combines Solar, Energy Software and Power Storage including 7.1kWh of Li battery storage and ability to run when grid goes down. 2012/01/24: Grid-scale energy storage will be economically viable in the UK. 2012/01/09: Are wind turbines increasing carbon emissions? includes comment that "Demand side response can reduce costs as well: The ECF Power Perspectives 2030 report found that around 10% of electricity demand in the EU would be shiftable within a day by 2030." 2011/03/25: Virtual Power Plants Aren't Just Virtual. 2011/03/01: RLtec and Sainsbury's do Dynamic Demand. See Dynamic Demand which "aims to promote the introduction of 'dynamic demand control' technologies on the UK", and also for example "A short review of energy information in domestic refrigeration and cooking", the UK Market Transformation Programme's What-If Web tool, and RLtec from ~2013 Open Energi. 2010/09/16: From the Roof, to a Battery, to the Grid. US Federal Energy Regulatory Commission (FERC) June 2009 study "finds the potential for peak electricity demand reductions across the country is between 38 gigawatts (GW) and 188 GW, up to 20 percent of national peak demand, depending on how extensively demand response is applied. This can reduce the need to operate hundreds of power plants during peak times." "A formal demonstration of the Dynamic Demand technology has been given a green light by OFGEM" in the UK as of 2008/12. As of 2008/2009 the UK grid's balancing costs are of the order of £100k/MW/year, ie £1 per year for every 10W of firm-frequency-response deferrable load and that load on all year would cost maybe £13 on a typical domestic tariff (assume 15p/kWh). GE Reinvents the Fridge (Treehugger 2008/10/30). VP Kevin Nolan explains: "Peak hour energy demand is growing faster than total energy demand. It is imperative that we begin to shift some of the energy load from peak hours to other parts of the day -- helping to avoid the need to build new power plants to meet the demand." "Europe needs dynamic demand directive" according to former president of the Chartered Institution of Building Services Engineers Terry Wyatt 2008/09/11. The existing UK Teleswitch system, broadcast over radio, controlling ~3m+ meters, and can initiate 'immediate' mode changes such as load-shedding within a couple of minutes, and staggered by region/DNO as needed. Toronto Hydro's [archive] peaksaver scheme to peak-shave a/c and heating load for a one-off CAD50 incentive. EDF's (Electricité de France) Tempo Tariff clearly explained which attempts to push use away from peak days as well as peak hours. "This system works by offering varying prices per kWh based upon the actual weather on particular days. The year is split up into 300 blue days when the price is advantageous; every Sunday is a blue day. Then there are 43 white days when the price is increased, this occasionally occurs on a Saturday but very rarely. And then the most expensive days are termed red days and there are 22 of these in a year. The red days are kept for between November 1 and March 31 and occur between Monday and Friday, never at a weekend or on public holidays. The system is designed to encourage people to think about when they use dishwashers, dryers and other electrical equipment. Each day it is decided what colour the following day is to be and this is either sent to the control box on the wall in your house, which will have a light on it telling you. Alternatively, you can visit the EDF website to see what colour the next day is going to be and you can even elect to receive a daily email which includes (non contractual) predictions for the following two days. In addition to the three colour bands, the Tempo system also has the Off-Peak tariff as well, giving total of six possible charging rates." TheWattSpot: ComEd (Commonwealth Edison) Residential Real-Time Pricing and automatic moderation of aircon demand in Illinois, US. Southern California Edison announced that 4.8 million of its customers will benefit from a $1.63 billion smart-metering programme with 5.3 million meters installed between 2009 and 2012. 2008/08/26 Register story US utilities plot remote switch off (I'm sorry Dave, I can't turn that kettle on). Building Smart Grid Systems: Is Your Neighborhood on Board? (Treehugger). "Smart grids are one step up from AMI on the evolutionary ladder because they allow two-way communication between homes and utilities and the ability to remotely control appliances and power consumption, which leads to accurate real-time pricing by utilities, and accurate monitoring and conservation. Utilities can send response demands to homes, such as requesting them to turn down a thermostat during peak hours, homeowner energy use habits can be tracked and adjusted, and a more honest and fair pricing system leads to better conservation abilities". The EuP eco-design of energy-using products (EuP) site. A device such as the Plogg might form the basis of sensing frequency, consumption, etc, and load control. "'Unrestricted' peak demand (as defined above) on the GB transmission system in ACS (average cold spell) conditions based on the projections made by the system 'Users'. This demand increases from the provisionally estimated outturn of 61.3GW in 2006/07 to 67.4 GW by 2013/14, which represents a growth of 1.4% per annum." "The Central Electricity Generating Board in England and Wales sought to achieve a plant margin of some 24% several years ahead of the event". UK government (BERR) 2007 report on dynamic demand. "DUKES": Digest of UK Energy Statistics notes amongst many other things that: in 2006, domestic electricity consumption was 29% of all UK demand of 406TWh (ie about 116TWh), of which only about 33% was on Economy 7 or another off-peak/grid-friendly tariff. Mean domestic electricity power demand was thus ~13GW, most of it potentially not 'off-peak'. [...] it is possible to make educated estimates that reconcile with the overall on-peak/off-peak split from DUKES because we know that a high proportion of heating will be off-peak and a high proportion of non-heating will be on-peak. In fact, if we assume that 80% of heating is off-peak and 85% of non-heating is on-peak, and we use the BREHOMES estimates of the electricity use by end use, then this produces figures that reconcile with the DUKES figure of about 67% on-peak and 33% off-peak [see the Domestic Energy Fact File]. These figures must be reasonably close to the true proportions, if they could actually be measured. This implies that off-peak electric space/water heating may be ~22% of UK domestic demand (26TWh/y), with a mean load of ~10GW in off-peak hours, presumably skewed away from summer when only DHW would be needed but also thus more of it interruptible in winter when general demand is higher too. Energy consumption in the United Kingdom includes table updates to 2008. The Domestic Energy Fact File, available at http://projects.bre.co.uk/factfile/BR457prtnew.pdf, indicates per-UK-household annual energy consumption for water heating remained remarkably constant from 1970 to 2001 at about 50GJ for space heating and 20GJ for water heating, ie ~20MWh. Assuming those to still hold approximately true in 2008 over ~25M households, that implies aggregate UK annual domestic space and water heating demand of ~500TWh, which agrees roughly with the DUKES 2007 total domestic energy balance figures of 44mtoe/1.8x10^18J/513TWh, and conversely ~1.6M (of ~25M) UK households currently fully heated by electricity. The vehicle-to-grid (V2G) distributed grid-support idea research at University of Delaware, and industry. See Free Market Energy Could Cost about how data-centres could be exposed to (very) dynamic pricing, and Juicing the System about exposing domestic users to such forces. The Emerging Electanet: "the emerging group of networks at or close to the point of energy use that leverage existing Internet and communications infrastructure to make energy production and consumption smart." Fridges of the world, unite describes 2007 experiments by American Department of Energy's Pacific Northwest National Laboratory (PNNL). 2008 claims that renewable power can plug the "energy gap" for the UK as conventional fossil-fuel and nuclear plant goes off-line. Dynamic demand response could do away with costly balancing capacity Utility Week 2008/09/19. Claverton Energy Group space Energypedia. The ADDRESS (Active distribution networks with full integration of demand and distributed energy resources) project, including EDF in the UK. The home energy-management startup Greenbox from the creators of Flash, interacts with dynamic pricing to help users move loads away from peak demand times. With many thanks to Richard Price of National Grid I have per-minute samples of UK grid frequency for the whole of August 2008 (.xls) and for the single day 2008/05/27 (.xls) when Sizewell-B (and other plant) tripped, causing loss of service to 500,000 people and the first Demand Control Imminent warning from the National Grid (as System Operator or 'SO') in about 4 years. National Grid has its own report on the outage (PDF) in which is reported for instance that 2253MW of capacity was lost and 581MW of load was automatically shed (and a further 1200MW manually by voltage reduction) to protect the grid and which was mainly reconnected within about 40 minutes: load volumes and timings that DD might handle easily without blackouts or even explicit SO/DNO intervention. Normal operational limits on the 50Hz-nominal UK grid frequency are +/- 0.2Hz, statutory limits are +/- 0.5Hz (1%), the maximum expected drop from an Infrequent Infeed Loss Risk of 1320MW is -0.8Hz, and low frequency relays start shedding load to protect the grid at -1.2Hz (48.8Hz) with 5% intended to be shed in this first tranche. Significant frequency deviations that the System Operator has not been able to contain to its standards are rare: "5.5.3 There have only been two reportable frequency deviations since 1989/90. The first on 17th November 1995, when the frequency fell to 49.184Hz for 3 min 40 sec for a 1280MW generation loss and the second on 19th February 1996, when the frequency fell to 49.038Hz for 3 min 20 sec for a 1000MW generation loss". The National Grid's Real Time Operational Data area on-line. Fieldlines thread on this piece. IEEE 1547 "Standard for Interconnecting Distributed Resources with Electric Power Systems" and a discussion at EnergyPulse. National Grid highlights need for demand management. MacKay thinks maybe UK blackouts by 2016? December 2009 DECC Smart Grid report including aspects of dynamic demand. 2009 potential discretionary load in GB is estimated to be between 9 GW and 17 GW (IHS Global Insight Demand side market participation report for DECC. See http://webarchive.nationalarchives.gov.uk/20110405162642/http://www.decc.gov.uk/en/content/cms/consultations/electricsecure/electricsecure.aspx). 2008 paper (PDF) by Michael Dittmar on peak load stress problem in France and Europe. TreeHugger: Understanding the Smart Grid: What's Great and What's Wrong with Electricity 2.0 (Video) (including dynamic demand and its bedfellows). Simple and clear "smart grid" summary from Con Edison (New York). Cited in US patent 8805597 "Electrical appliance energy consumption control" filing Date 09/18/2009. First published 2008-08-06 , updated 2019-04-22 . Site copyright © 2007-2019 Damon Hart-Davis. Hosted by ExNet.